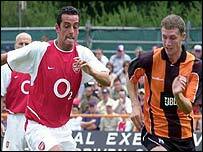 Arsenal could not find the net against Barnet as their pre-season friendly at Underhill ended in a draw. The Gunners, playing their last warm-up game on English soil, were given a tough workout by the Conference side. Arsene Wenger included two trialists in his starting line-up, Gael Clichy, a left-back from AS Cannes, and Beveren midfielder Yaya Toure, the younger brother of current Gunner Kolo. Yaya, playing up front in the second half, blotted his copy book by missing Arsenal's clearest chance of the game, heading a cross from Quincy Owusu-Abeyie wide.